Full of energy and ready for a comeback season, the men’s hockey team ended its nail-biting season opener in a 1-1 tie against Connecticut College. Conn opened up the scoring with twelve minutes to go in the first period with a deflection from Tim DePretoro that ended up in the top shelf past Wesleyan goalie Dawson Sprigings ’17. Sprigings was screened by several opposing players when the shot came in and suddenly changed directions. Captain Jay Matthews ’16 tied the game with just over two minutes left in the second period with assists from line mates James Kline ’17 and Vincent Lima ’19 in a tic-tac-toe passing display. Once the game was tied, both teams ratcheted up the pace of their play and Wesleyan had an abundance of quality chances that were all denied by Conn College netminder Tom Conlin, who made an astonishing 41 saves through all three periods and overtime. When asked who stood out from the game, Wesleyan head coach Chris Potter had an immediate and unequivocal response. After a grueling season last year that was plagued by injuries, this year’s team features ten new first-year recruits who are ready to make their mark immediately. Lima and Luke Babcock ’19 both flourished in their debuts for the Cardinals, with several scoring chances and even a first career point for Lima, who was featured on the top forward line alongside seasoned veterans Kline and Matthews. 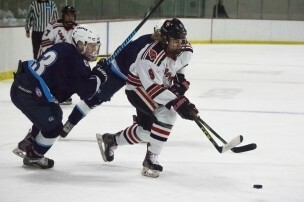 Both Babcock and Lima come from the St. Paul’s School, which has proven to be an effective feeder for Wesleyan’s hockey program. Exhibiting an abundance of talent, this year’s relatively large first-year class will be competing for playing time. Limited to only twenty skaters who are able to dress on game day, around ten Wesleyan players are forced to watch from the stands. Known in the hockey world as healthy scratches, these players take statistics and analyze the game when they’re not playing, often providing key information to the coaches who see the game from ice-level. Oliver also noted that competition for places is a healthy process that takes place in practice, forcing everyone to stay on their game and to continue improving. Defenseman Chad Malinowski ’19, who got the opportunity to play in the season opener and exhibit his powerful slap shot from the point, is glad to finally be at Wesleyan playing college hockey. Going forward, the Cardinals will be looking to flourish with their new reservoir of talent in the class of 2019. There is also a good core of veterans remaining from last season, as exhibited by Kline and Matthews on the top forward line, as well as by co-captain Eric Casey ’16 and Robby Harbison ’17 on defense. Coach Potter elaborated on how Kline and Matthews are leading the way on the top forward line. On Saturday, the Cardinals fought back from one down to tie Tufts 1-1 in a game that again featured a scoreless overtime. Kline equalized in the third period after the Jumbos took the lead in the second. Tufts goalkeeper Nick Nunges made a whopping 46 saves, as the Cardinals put him under pressure all game long but couldn’t find another way past the talented goaltender. Next for the Cards is a tilt at home versus Salve Regina University on Saturday, Nov. 28 at 4:00 p.m.